WSU linebacker Emmett Tela (left) and cornerback Taron Johnson (right) converge on SFA wide receiver DJ Ward as they attempt to tackle him. Tela led the Wildcats in the loss with nine tackles. History did not repeat itself on Saturday night, as the Weber State football team dropped to 0-4 on the season after losing to Stephen F. Austin 35-20. Last season, the Wildcats hosted the Lumberjacks in their season-opening game. In the first game in history between the two teams, Weber State came away victorious with a final score of 50-40. But in Nacogdoches, Texas on Saturday night, penalties and turnovers once again crushed any chance of the Wildcats getting their first win under head coach Jay Hill. Not only were the Wildcats flagged for 10 or more penalties for the second consecutive game, they were flagged for a season-high 15 penalties, totalling 107 penalty yards. 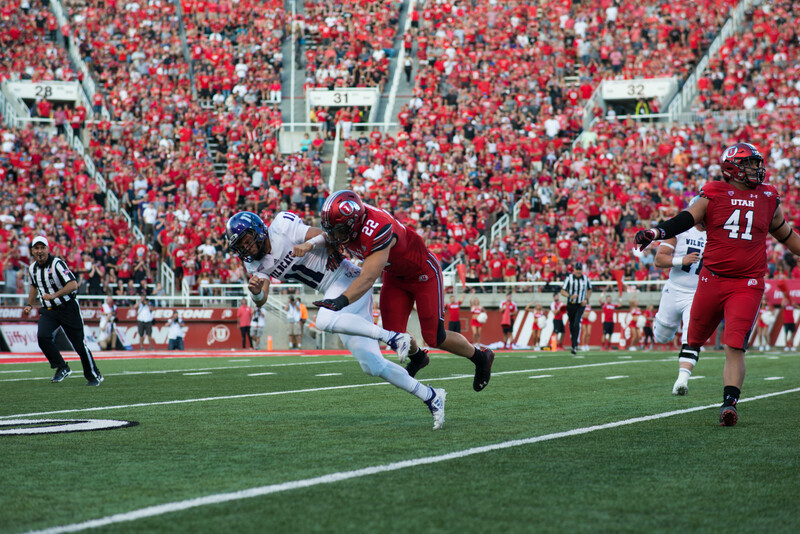 It was the first time this season that Weber State had more than 80 penalty yards in a game, and the most penalty yards in a game since November 9, 2013, when the Wildcats were flagged 11 penalties for 124 yards in a 27-21 loss to Southern Utah. Wildcat running back Zach Smith rushed for a career-high 147 yards in the game on Saturday. The Wildcats ended up losing the game, 50-40. The Wildcats had struggles holding onto the ball again in the loss, as they lost a fumble for the third straight game. Since snapping Arizona State’s 29-game streak of at least one forced turnover, Weber State has fumbled the ball six times in three games, losing possession of the ball five of those times. The game also marked a first for the Wildcats, as quarterback Billy Green threw his first two interceptions of the season. Green’s first interception of the season snapped a streak of 79 completed passes without an interception to start the season, the most since Mike Hoke completed 99 passes without an interception in 2011. WSU quarterback Billy Green threw for 273 yards against Stephen F. Austin, as he surpassed 1,000 yards passing on the year. Green nows averages 261.5 yards per game. Despite throwing two interceptions and recording a fumble, Green had an otherwise solid night, completing 30 of 49 passes for 273 yards and three touchdowns. Green now has 1,046 passing yards on the season, averaging 261.5 yards per game. He is the first WSU quarterback to reach 1,000 yards passing in the first four games of the season since Cameron Higgins threw for 1,075 yards through the Wildcats’ first four games in 2010. Senior wide receiver Shaydon Kehano was another bright spot for the Wildcats in the loss, catching 12 passes for a career-high 122 yards and two touchdowns. On his third reception in the game, Kehano became the 23rd player in Weber State history with 100 or more career receptions. He finished the night with 109 career receptions, tying him with former Wildcat Joe Collins for 19th among career reception leaders. Kehano’s 12 receptions also placed him in the single-game record books, as he became the first Wildcat with 12 or more receptions in a game since Cam Quayle against Toledo in 1996. Senior wide receiver Shaydon Kehano led the Wildcats with a career-high 122 yards receiving and two touchdowns on 12 receptions. Kehano became the 23rd player in WSU history with at least 100 career receptions in the loss. Saturday’s game wrapped up the Wildcats’ non-conference schedule, marking the third time in the last four seasons that the team failed to win a non-conference game. 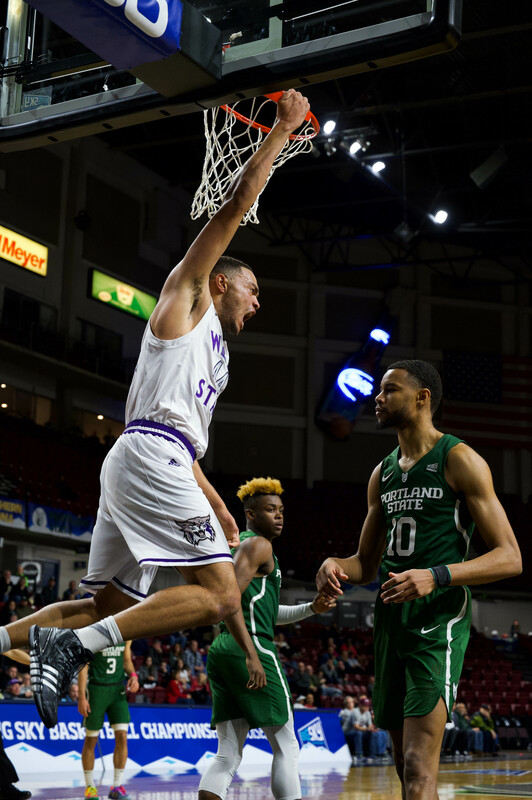 Last season’s win against the Lumberjacks is the only non-conference win for Weber State since 2011. The Wildcats will open conference play on the road this weekend against Southern Utah. Weber State and Southern Utah have split their last two matches, with the Wildcats winning 24-22 in Cedar City in 2012, while the Thunderbirds won in Ogden 27-21 last season.